This is registration for the meeting on 12-13th of July, 2019. For information on the pre & post trips click here. Meeting registration is $50 includes attendance to the meeting talks on biodiversity and current research. Coffee breaks and lunch. Click here for information on meeting field trips on the 12 & 14th. Members Only registration includes attendance to the meeting talks on biodiversity and current research. Coffee breaks and lunch. Click here for information on meeting field trips on the 12 & 14th. The meeting Dinner will be held on July 13th at the beautiful McKinney Roughs meeting center. 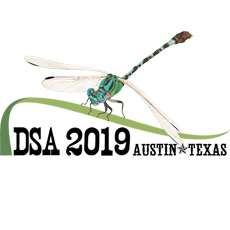 It will be a catered Texas meal after the meeting for folks to mingle and share odonate stories. DSA 2019 t-shirts will be available for order on demand before the meeting. Money raised from these shirts will help fund DSA society research grants. We will have a small number (5-10 of each size) at the meeting available for first come first serve basis.